Styled with aubrielle top and cherice pant . For work or a pair of jeans! 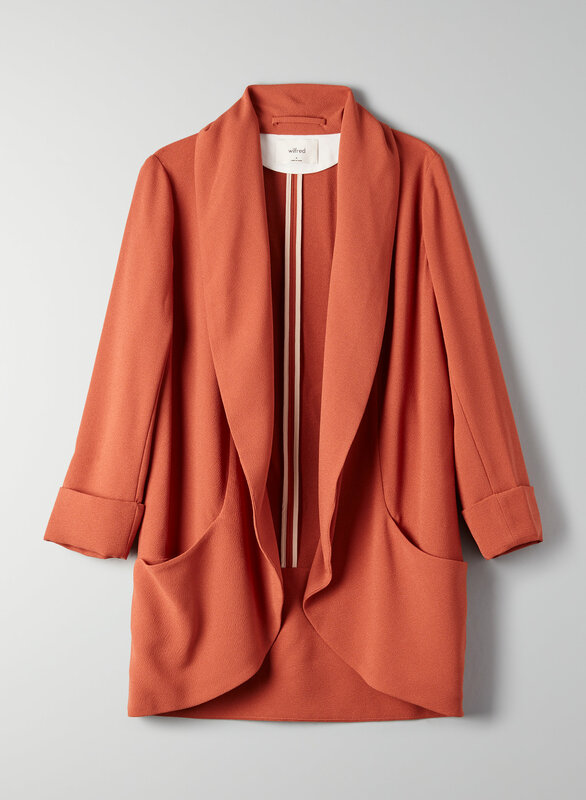 I truly love the Chevalier jacket - I have it in7 colours (and counting)! I pretty much wear these to work every day - they have the perfect mix of professionalism and style, and let’s be honest the pockets are SO useful! Loved the colour, but the fit was a bit off. Ask the collar kept flipping. Classy and timeless with good structure but still comfortable. Perfect for business casual or to dress up a casual outfit. I want to buy it in every color. Tight in the sleeves at first but after the first wear, it feels much better. I usually wear a size 8 or 10. Purchased this blazer a few years ago in an size 8 and wished I had sizes down. The fit was very generous. I decided to purchase a different colour so I ordered the size 6 but unfortunately the sizing has changed. I don’t think an 8 would even fit. Perfect for the office. It is a bit long at the back but that’s the style! Fits larger overall, but smaller in the arms. This is very pretty with flowing fabric. I sized up because I was worried the shoulders would be tight. The bigger size is perfect in the shoulders, but a little roomy elsewhere, but with the cut and drape, I think it will still be fine. The crete colour is a pleasant mix between beige and ivory, just what I wanted! Love this jacket feels light and casual but looks professional and stylish. Just made my second purchase . 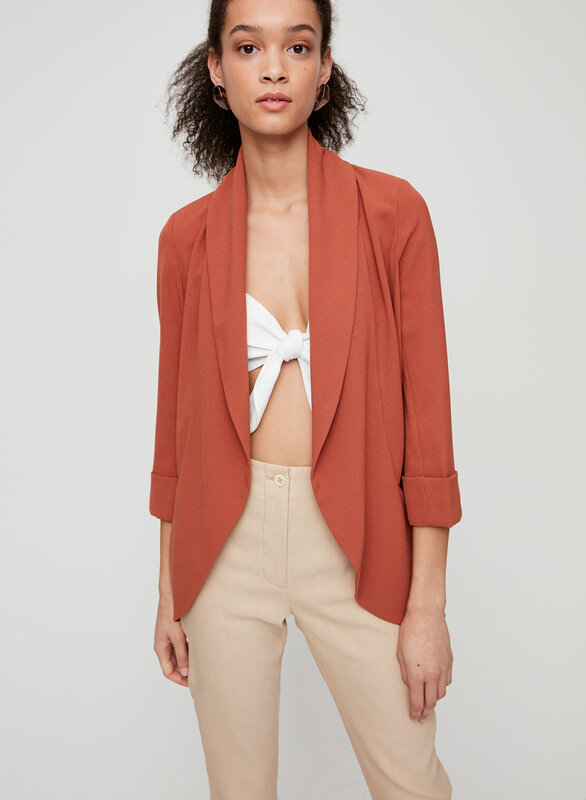 A classic blazer that can be dressed up or down. I had to size down as my regular size was too baggy looking and it just didn't look very refined/polished (which is kind of the point of a blazer). The smaller size looks way better but is a bit tight in the shoulders. Nothing uncomfortable so I'm keeping it. The length is great and the material is absolutely gorgeous. Great blazer. Size small, size 2 would be a good fit. Beautiful addition to my collection! Love the fit, very flattering on and can be worn with both jeans and dress pants which I love! I really like how it flows. The fit is great . If you want to look dressy and don’t have much time just throw this on and your done ! I returned for another jacket - the crepe material was not for me. Was a little itchy. Also, not sure if I’m in between sizes ordered the 10 was a little big. Ordered another jacket in an 8 and fit great! My Daughter-in-law loves it and my other girls said where are ours!! A bit uncomfortble on shoulders and arms. 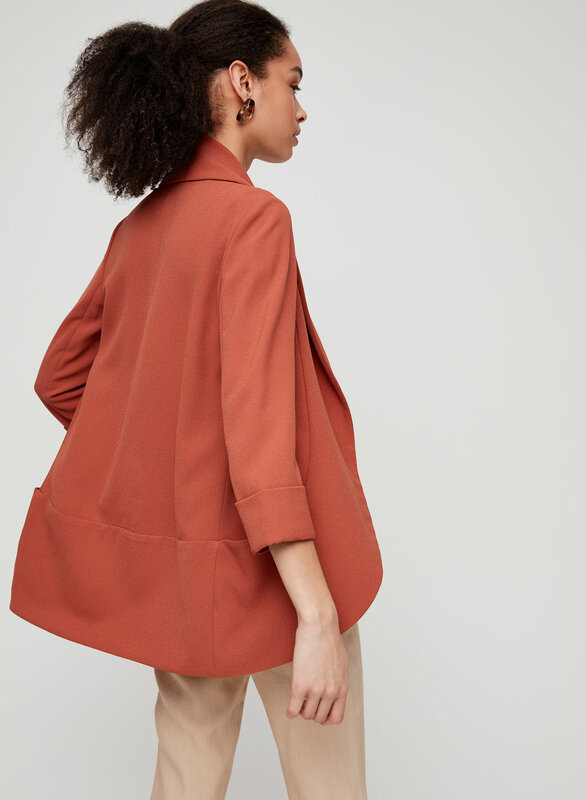 The crepe fabric is super stretchy and comfortable, this jacket is great to wear to work or just to throw on over a T-shirt and jeans. Love this jacket. I own it in multiple colours. It never disappoints. Excellent tailoring, and super comfy. It can be dressed up or down. I love this jacket and was glad that it went on sale for Black Friday! Fits great and feels high quality. I love how versatile this jacket is and how it dresses up any outfit. It is loose fitting and the colour is very neutral so it goes with anything. This is probably the only blazer I've purchased that fit me perfectly. Perfect for work! Can be dressed up or dressed down. This is one of my favorite jacket - I own black and ivory beige, and in fact this is the 2nd ivory beige I purchase because I wear it all the time. Perfect to dress it up and down. Doesn't wrinkle so it is my travel essentials too. Works for a business trip or a personal trip. True to size and very flattering fit as well as colour, I also appreciated the hidden pocket detail! Easy to dress up or pair with jeans. Light weight and breathable. I want one in every colour now! Fits a bit big. Bought a 4 so I could layer underneath.